Why and in what ways have lawyers been importing economic theories into a legal environment, and how has this shaped scholarly research, judicial and legislative work? Since the financial crisis, corporate or capital markets law has been the focus of attention by academia and media. Formal modelling has been used to describe how capital markets work and, later, has been criticised for its abstract assumptions. Empirical legal studies and regulatory impact assessments offered different ways forward. This book presents a new approach to the risks and benefits of interdisciplinary policy work. The benefits economic theory brings for reliable and tested lawmaking are contrasted with important challenges including the significant differences of research methodology, leading to misunderstandings and problems of efficient implementation of economic theory's findings into the legal world. 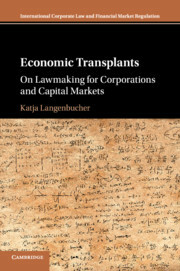 Katja Langenbucher's innovative research scrutinises the potential of economic theory to European legislators faced with a lack of democratic accountability. Ogorek, Regina (2008) Richterkönig oder Subsumtionsautomat? Zur Justiztheorie im 19. Jahrhundert Frankfurt:Klostermann, 2nd edn.